As luck would have it (#joke), I came down with the same cold a few days later. The first batch of soup was long gone, but I had extra of all of the ingredients on hand. Normally, I’m not one for much cooking when I’m sick — Shin Ramyun, yes please! — but my memories of both its excellence and its ease of preparation were quite fresh, so I simmered up another pot. I can’t for sure say whether I got lucky or if it really is magical soup, but my cold was near-entirely gone 48 hours later, so there’s that! Heat the olive oil in a large pot over medium heat; add the onion, carrot, celery, and a large pinch of salt. Cook, stirring occasionally, until the vegetables are nearly tender, 5-8 minutes. Add the garlic, ginger, turmeric, and chili flakes; cook for 30 seconds, or until fragrant, then add the vegetable stock. Bring to a boil, reduce the heat to maintain a simmer, then cook until the vegetables are completely tender. Meanwhile, cook the orzo in a small pot of generously-salted water until al dente. Drain, then add to the soup. In a small bowl, mix together the miso and apple cider vinegar with a fork. Ladle in enough of the broth to fully dissolve the miso, using the fork to mix. Add this to the soup, stir to evenly distribute, then season to taste with additional miso or apple cider vinegar, as needed (repeat the same steps with dissolving the miso in the small bowl before adding, to make it easier to evenly distribute it in the soup). Ladle the soup into bowls and garnish with parsley and lots of black pepper. Instead of mincing the garlic and ginger on a cutting board with a knife, I like to use a microplane to grate them. A standard microplane works, but for efficiency, I usually use this coarser one as it moves through the ginger much more quickly. Or, ginger juice can be used 1:1 for the minced ginger — add it when you add the stock. Between the ginger, chili flakes, and pepper, this broth is pretty fiery; if you're sensitive to spicy food, start with half the amount of chili flakes. I like to cook the orzo separately, in very-salty water, so that it is properly seasoned (the broth is barely salty before you add the miso). I also prefer to cook it in its own pot, because I can then store the leftover soup base and cooked orzo in separate containers. 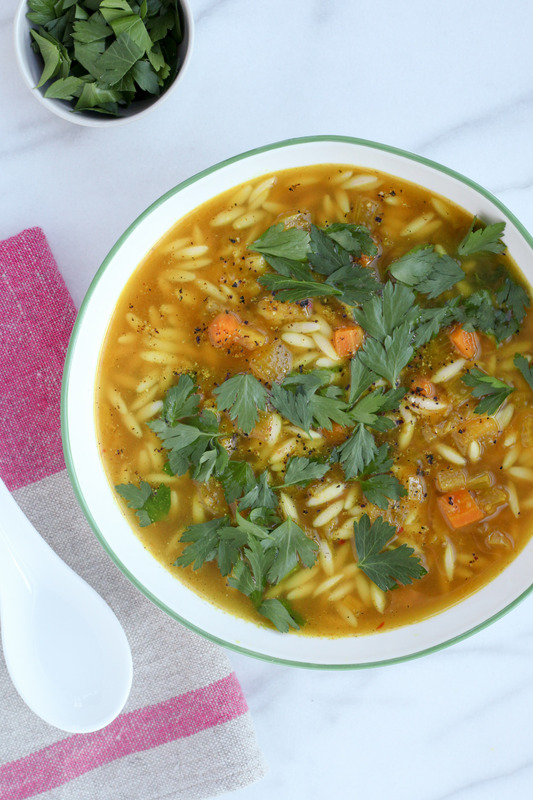 (The orzo will bloat and get a bit soggy if stored in the broth.) 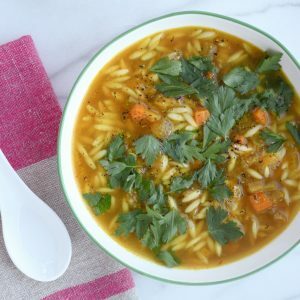 That said, if you plan to eat all of the soup at once, and don't want to dirty an extra pot, you can add the orzo to the soup to cook. The right amount of miso to use depends largely on your stock. I used unsalted stock (this recipe, omitting the soy sauce), and 3 tablespoons of miso was just right. Chicken stock is also a great swap for the vegetable, if you eat meat. If you eat meat, a bit of shredded chicken is an excellent addition. In an ideal world, poached is my preference, but leftover roast chicken also works marvelously.